Easy Black Bean Soup, a healthy, super flavorful vegetarian soup! 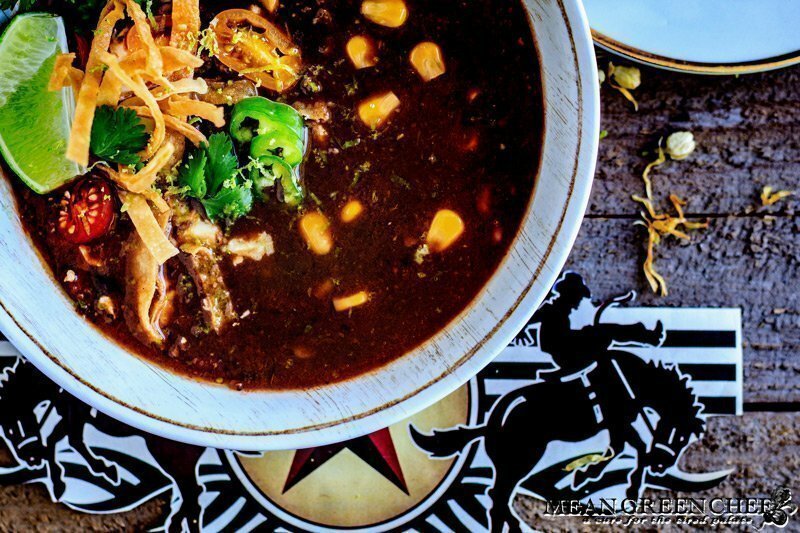 Enjoy loads of black beans, fire roasted tomatoes, corn, sweet and spicy peppers, garlic and everything that makes for great southwest fare! Top it off with a handful of green cilantro, chilies, tomatoes, crispy tortilla strips, and a fresh squeeze of lime, to make it downright killer! Also a great addition to our Mexican Tortilla Chicken Soup, where you’ll find the trick to making your own tortilla crisps. Trust me they’re worth the effort! It’s versatile too, make it with dried or canned beans. Purée a cup or two and combine it back into the soup for great body, hell purée the entire batch for a crazy good dip! If brothy soup is more to your liking skip the purée and ladle into warm bowls and serve. Try adding rice or quinoa for a super satisfying meal, or spoon some over baked sweet potatoes. Do I need to rinse canned beans? I always suggest a good rinse when using canned beans. The liquid is basically the water they were initially canned in, which becomes thick from the starch that’s pulled from the beans. There’s also added sodium in the water and you’ll occasionally get a metallic taste from the can. So a nice wash removes the excess starch, salt and metal flavor (if any). Why should I soak dried beans before cooking? There are a lot of different opinions regarding this question, as there are bean recipes. A dear friend and Cuban restaurant owner who made the best black beans I’ve ever had always soaked his beans before cooking, no salt added. Which means I’ve always soaked mine too! Pre-soaking black beans reduces the cooking time and improves texture too. Don’t add salt when soaking but do add a 1/4 teaspoon of baking soda. Food Nerd Alert: Baking soda tenderizes the beans, by adding 1/4 teaspoon to 1 pound of beans. It significantly decreases the content of the raffinose family of sugars. Which means less gas and bloating! Woot! Just be sure to rinse really well after the soak, keep reading for directions. Dump the beans into a fine mesh colander, rinse and pick through to make sure that there are no stones or twigs, it can happen! Imagine breaking a guests tooth, or your own? There are two soaking methods: Overnight and quick-soak. Overnight method (my preferred): Add the washed beans to a large container to allow for expansion, plus the 1/4 teaspoon of baking soda. Add enough water to cover the beans by an excess of 2-inches of water. Let the beans sit overnight. Before cooking the next day, drain the beans, flush with water and proceed with cooking directions. If your kitchen is hot, refrigerate black beans while they soak to prevent fermentation. Quick-soak method: Place the beans in a large pot and cover with water and 1/4 teaspoon baking soda; bring to a boil and continue to boil for two minutes. Remove from the heat and let sit covered for two hours. Drain, rinse thoroughly, and continue with the recipe. However, the quick-soak method might cause your beans to break-up when cooking. Easy Black Bean Soup, a healthy, super flavorful vegetarian soup! Enjoy loads of black beans, fire roasted tomatoes, corn, peppers, garlic and everything that makes a for great southwest flare! Dump the beans into a fine mesh colander, rinse and pick through to make sure that there are no stones or twigs. Add the washed beans to a large container to allow for expansion, plus a 1/4 teaspoon of baking soda. Add enough water to cover the beans by an excess of 2-inches of water. Let the beans sit overnight. Before cooking the next day, drain the beans, flush well with water and then proceed with recipe. Heat a large heavy-bottomed Dutch Oven or soup pot over medium-high heat. Add the olive oil and reheat for 30 seconds. Stir in the onions, red bell, yellow bell, green bell, jalapenos, and corn. Sauté for 5 minutes. Add the garlic, cumin, chili powder, and oregano sauté an additional 2 minutes. Stir in the tomatoes, all of the black beans, and broth. Bring to a simmer and reduce heat to medium-low, cook for 90 minutes or until the desired doneness., Stir frequently and taste to test for doneness and flavor. 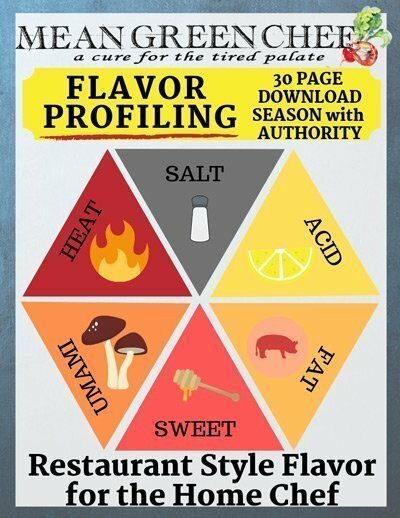 Adjust with salt, pepper and more seasonings as desired. Remove a cup and a half of the cooked beans and place in a food processor or blender. Purée until smooth and then add back to the soup and stir until combined. Remove from the heat, ladle into warm bowls and garnish with crispy tortilla strips, cilantro, and fresh lime juice, or any other desired toppings. Store leftovers in an airtight container and refrigerate up to 3-4 days. To freeze, cool completely and store in an airtight container or freezer bags up to 6 months. If you’re craving another great soup idea then you may want to try our Lasagna Soup rich with flavor and homemade egg yolk pasta (you can always use the pasta you have on hand too). Another favourite of mine!! Wow you definitely can cook! Can’t wait to try this recipe at home.